My friends and I initially enter Daikaya the wrong way. The relatively new two-in-one Japanese restaurant has separate entrances. One door takes you to a wonderful outpost for ramen noodles. The other leads you to a staircase where you head upstairs for an izakaya (small plates) menu. We climb the steps of the izakaya, prompting my BFF to ask whether we’ve been here before. “It looks so familiar,” she says. “You’re thinking of Izakaya Seki,” I reply, although the similarity is more about Japanese small plates than the decor. “Oh, you mean Toki Underground,” I say. While there are definite similarities, including the fact that all three restaurants are putting out terrific Japanese food, Daikaya has its own merits. First are the touches of whimsy that attract our attention. Menus are stapled inside Japanese fashion magazines. The walls are covered with beautiful swatches of fabric. Best of all is a menu that has so many appealing pescetarian and vegetarian options, that we don’t hesitate to go fully meatless so that everyone in our group of five women can share dishes. When I am at a restaurant with small plates, I hope to start out strong. If the first few dishes are good, there is a pardon for something that’s less than stellar. Thankfully, our first two dishes at Daikaya hit it out of the park. 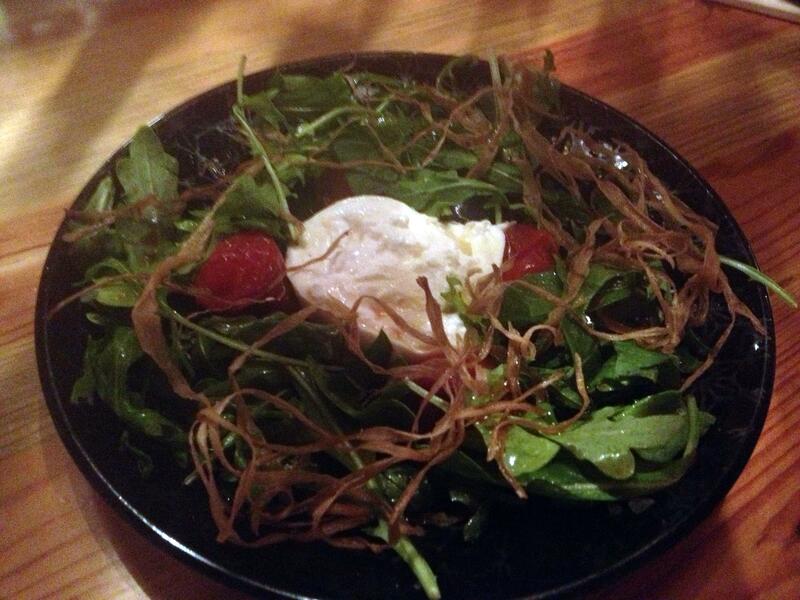 Mizuna salad with burrata tomatoes and dashi gelee, as well as tuna poke dotted with sesame and scallions, have bold flavors that make us sit up and take notice. 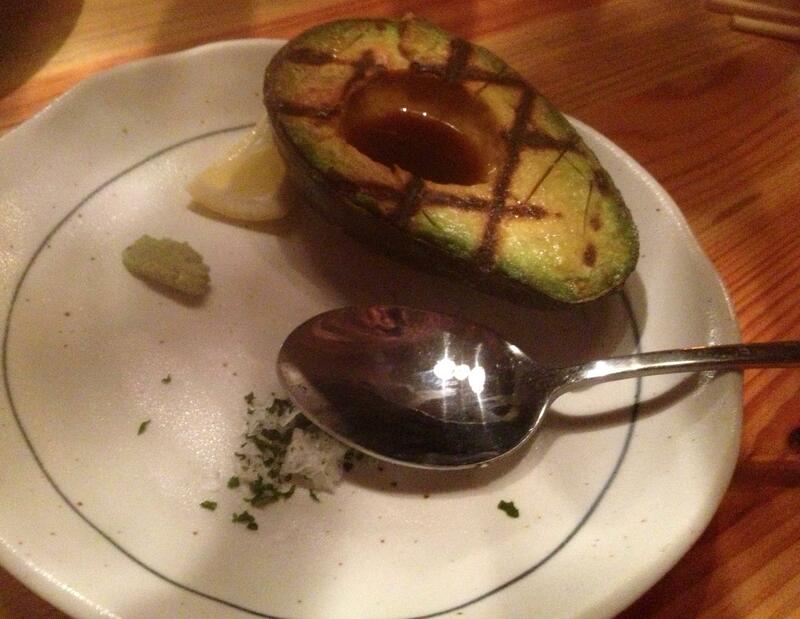 Grilled avocado with housemade ponzu, fresh wasabi, and nori salt sounds fairly simple. The smoky rich flavor astounds us. Two of these, please. Shishito pepper with gouda cheese and togarashi keeps us on our toes, as some bites are spicier than others. Our server has properly prepared us, so we’re ready for the heat. Miso salmon has us mimicking the “Saturday Night Live” character Linda Richman cooing about Barbra Streisand. (think early 1990’s) “It’s like buttah,” we say. I’m grateful we’ve decided to double up on most of our dishes, so we can thoroughly enjoy the tastes. This one absolutely merits savoring. 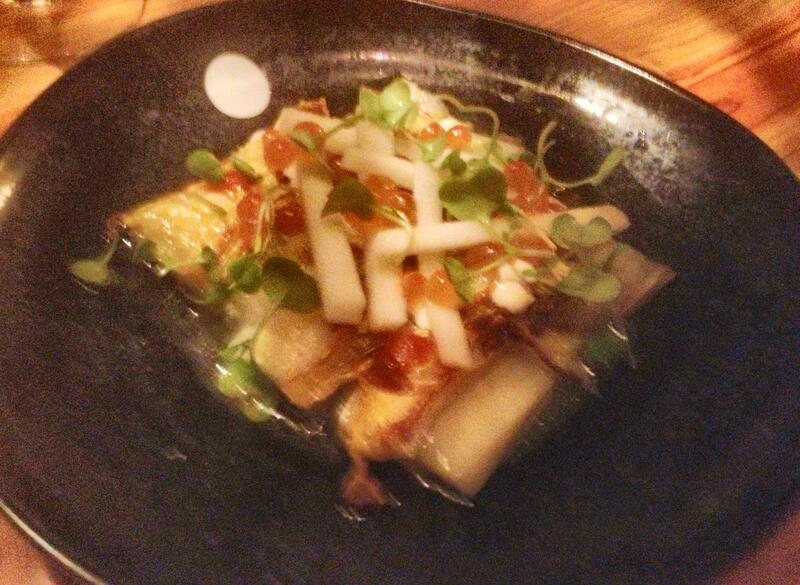 Another favorite – and we declare each dish that comes out our new favorite- is warm napa cabbage salad with apples, kewpie-yogurt and salmon roe. 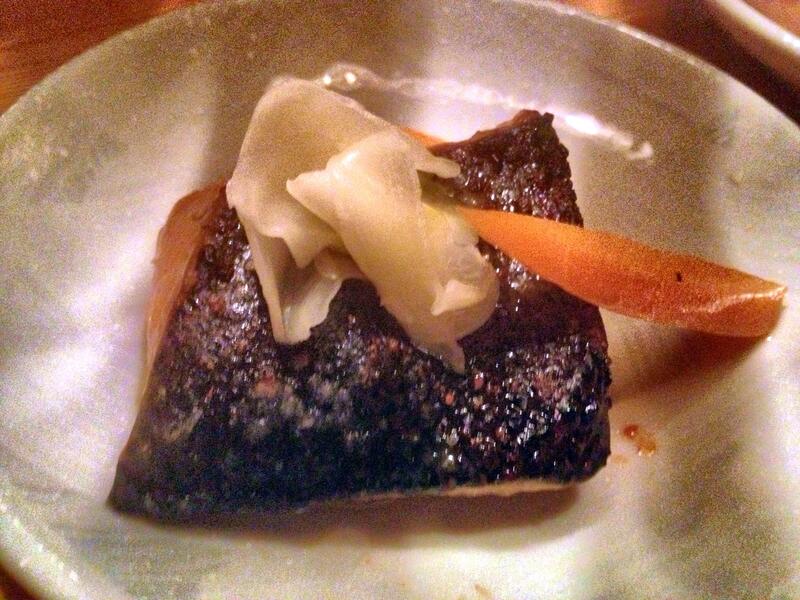 This one captures my heart, with the warm cabbage pairing beautifully with tart apples and salty squishy roe. Zucchini with lemon and thyme on skewers are perfectly grilled and well suited to round out our selection of dishes. But we’re still not quite satisfied. We want more food. We order a round of onigiri rice balls, which are filling, if not not the most interesting way to end the meal. Another order of tuna poke brings us back to our original state of delight. There’s much of the menu left for us to explore, and we vow to return in the near future. 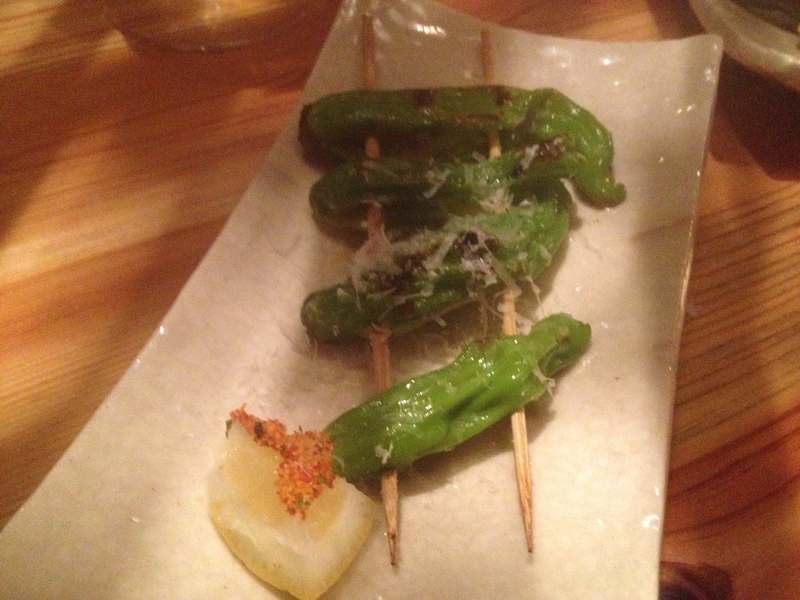 Our ascent to Daikaya has taken us into a wonderful world of exotic, and I daresay heavenly flavors.